Conifer Bailey Forums 285 Bound • View topic - Custom Pet Portraits - perfect for the holidays! Post subject: Custom Pet Portraits - perfect for the holidays! I am a local Colorado artist- I work mostly in acrylic on canvas. I do commission work from pet portraits to wildlife and Colorado landscapes. My work is colorful and bold and really ties a room together! Pet portraits are done from your photos- emailed to me or SnailMailed. I do not charge extra for other pets in the painting. Turn around time is about 2 weeks tops, usually less. Rush orders are possible. And GIFT CERTIFICATES are available!! 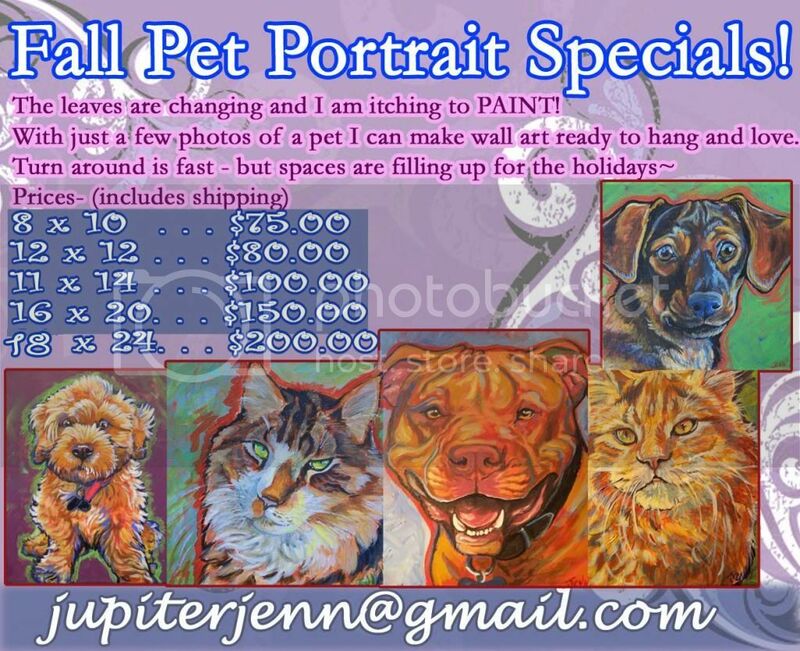 Post subject: Re: Custom Pet Portraits - perfect for the holidays!